Kropuenske’s players appreciate his gametime intensity even more thanks to his commitment to his players off the court. Photo by Lauren Bremer. 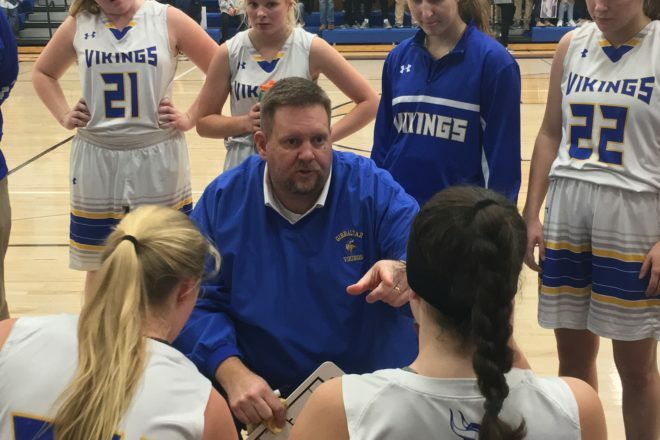 On Nov. 15, Josh Kropuenske tallied his 100th win as the Gibraltar girls basketball coach, and this Friday his team begins the postseason with a No. 1 seed in regional play. One doesn’t have to look back too far in Gibraltar’s yearbooks to see that in the ’80s and ’90s, finishing the season with a few wins was the norm, but Coach K, as everyone in this community refers to him, doesn’t take much credit for the turnaround or surpassing 100 victories. Such is Coach K. The selfless, even-keeled, rock-steady member of the Northern Door community has been shaping the lives of our youngsters one basketball season at a time. Now in his ninth season as the girls’ head coach, he is approaching 20 combined years of coaching basketball at Gibraltar schools at nearly every level, from fourth grade to varsity. His athletes have bought into a program that rewards hard work, dedication, a willingness to learn from mistakes and above all else, being a good teammate. Along with his wife, Alicia, and sons Tyler and Ryan, Kropuenske owns and operates Baileys Grove Campground. Spring to autumn, the family is busy running the business, but for the last 20 winters, basketball comes first. Kropuenske has been prowling the sidelines of basketball teams at Gibraltar at every level for nearly 20 years. Photo by Len Villano. Kropuenske’s impact is visible in many ways, especially in former players who spent many hours in Coach K’s gym. Take Makenna Ash, class of 2015, who went on to play at St. Olaf College. That kind of connection with his players is part of what keeps 20 years of Gibraltar graduates, men and women, returning to watch games, showing up at the campground for a visit and volunteering at practice. 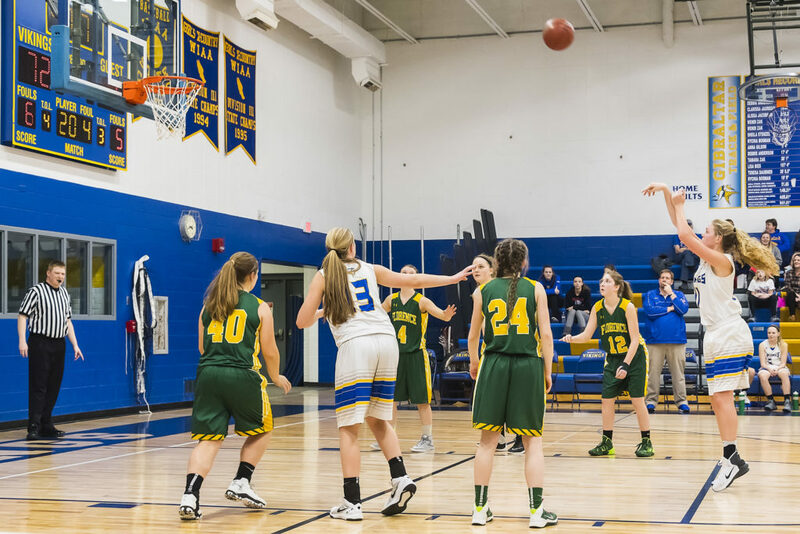 On Dec. 20, senior Payton Pluff scored her 1,000th point. In the stands that night was a veritable Who’s Who of Gibraltar basketball alumni. Kropuenske’s players from as far back as 1999 were in attendance, returning to support the team and the coach who had supported them. Kropuenske’s younger son, Ryan, co-captain of the Gibraltar boys varsity squad, cites this as one of the things his dad is most proud of. “I know that’s really important for him because he really enjoys when past players come back and share their experiences and share their knowledge of what it takes to be a winning program, and my dad has always valued their input when they come back. It keeps the culture going,” Ryan said. The culture that Ryan refers to is central to the why of Kropuenske’s coaching. Many people who coach name passion for the game or the thrill of competition as reasons to do it. For Coach K, the culture of the program is something that is far more important than a win-loss record. Coaching the whole child, not just the athlete, has created a lifelong love of the game and coaching for many of his former players. 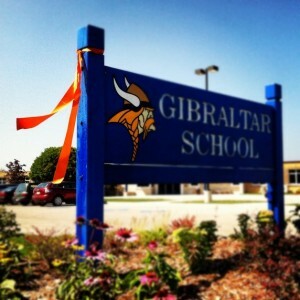 Five of his former players are coaches at Gibraltar, three of whom coach boys basketball. We just want a coach who cares, they told him. “If that’s all they wanted, I thought, this will be a piece of cake,” Coach K recalled. “I can care. We can care about you as individuals and as young women. I think that’s the thing I’m most proud of. One hundred wins are nice, but this is better,” Coach K recalled. That attitude continues when it comes to his family, too. Out on the court is where Josh and Alicia fell in love, and they’ve continued to share that love of the game with their boys. Ryan and Tyler, now a sophomore and a football player at the University of Minnesota-Crookston, grew up in the gym, both watching early practices while wearing footie pajamas and seated in car seats on the sidelines. And for the whole ride, Alicia has been there as his best sounding board and biggest cheerleader. A two-time Utah state-championship runner-up, she is a formidable basketball player and former coach in her own right. “She’s the best base-line jump shooter I’ve seen in my life,” Coach K said. Ash recalls a fond memory of playing for Coach K at Algoma – a team that was winning state titles in Division 4 at the time. Nearing halftime, the overmatched Gibraltar squad was keeping the game tight, so Algoma coach Mark Zastrow – frustrated with his team’s play – called a timeout. Lessons like those are what Alicia sees as the heart of the program and their family. Josh Kropuenske’s impact of caring will far outlast the scoreboard because his legacy is walking among us.